This striking pavilion in Sandnes, Norway was constructed out of sustainably-sourced timbers and glass slates as a way to highlight environmentally friendly architecture and materials. Located at the crossroads of busy streets in the center of town, the pavilion also acts as an important meeting place, market hall and concert venue. 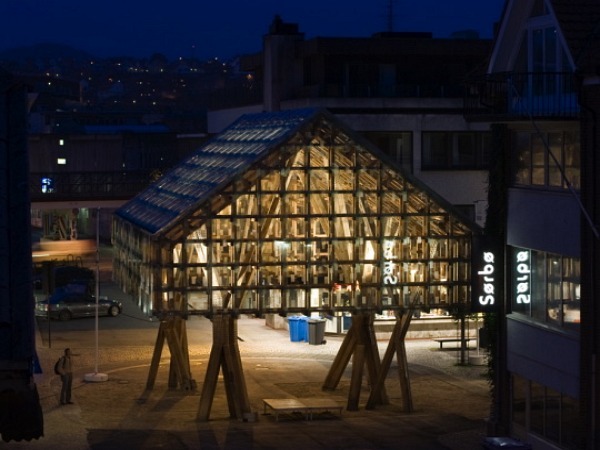 Designed and built by French and Norwegian firms, AWP and AtelierOslo, the Lantern Pavilion marries traditional timber architecture with newer contemporary architecture from both parts of the city. 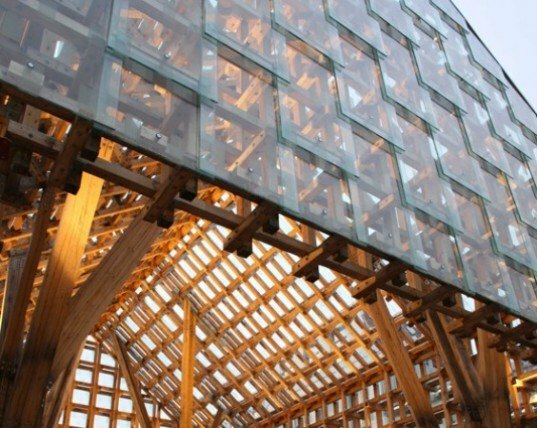 Sandnes was named one of the ‘Cultural Capitals’ of Europe in 2008 and the city wanted to promote the innovative use of sustainable timber in contemporary architecture in the public domain through a design competition. The French-Norwegian team, AWP + AtelierOslo took home first prize and constructed their 140 sq meter, timber-framed pavilion right in the heart of the city. The timber beams reflect the older architecture, while the glass is a nod to the newer construction. Large timber oak beams embedded in the concrete base are bolted together to form criss-crossing columns, which support the sculptural, geometric, wood frame. Glass covers the entire wood frame like slate tiles on a roof and each glass panel is printed with a translucent pattern, which reflects down onto the ground. The glass roof allows daylight to stream into the space during the day and provides a protected space for people to meet. At night, interior lighting reflects off the glass and makes the pavilion glow like a lantern. The pavilion is on tour and can be seen at the Scandinavia House in New York City through the Nordic Models + Common Grounds exhibition. Sandnes was named one of the 'Cultural Capitals' of Europe in 2008. The city wanted to promote the innovative use of sustainable timber in contemporary architecture in the public domain through a design competition. The French-Norwegian team, AWP + AtelierOslo took home first prize and constructed their 140 sq meter, timber-framed pavilion right in the heart of the city. The timber beams reflect the older architecture, while the glass is a nod to the newer construction. The glass slates en route to their installation on top of the pavilion. Large timber oak beams embedded in the concrete base are bolted together to form criss-crossing columns, which support the sculptural, geometric, wood frame. Glass covers the entire wood frame like slate tiles on a roof and each glass panel is printed with a translucent pattern, which reflects down onto the ground. At night, interior lighting reflects off the glass and makes the pavilion glow like a lantern. The pavilion has a lower profile than the surrounding buildings so as not to compete with them, but instead to compliment them. Located at a busy crossroads, the pavilion takes up as much of the plaza as it could. Timber benches are built into the footings of the columns to provide seating for people enjoying the pavilion.